This is not, however, due to the ‘ancient hatreds’ often projected on to this complex canvas by the simplifying gaze of superficial observers. Indeed, as the all-too-similarly dysfunctional nature of post-war Bosnia-Herzegovina and Lebanon demonstrates, it is the consistent application of this stereotyping perspective by representatives of the ‘international community’—the most powerful states with a regional investment—which is the real problem, regardless of the fine-grained variety of the cases in point. For it leads, as in all three related agreements—Belfast (1998), Dayton (1995) and Taif (1989)—to the same outcome. The first step is a conceptual hoovering up of the unique individual diversity of the populace into communal tribes—Protestants and Catholics; Serbs, Croats and ‘Bosniaks’; Maronites, Sunni and Shia Muslims—failing to recognise the fundamental difficulty, as the late Italian political scientist Norberto Bobbio pointed out, that every democratic constitution is based on the individual citizen. The inevitable victim of this Realpolitik is universal norms: every human-rights convention, including those enshrining minority rights, requires the individual to be the rights-bearer; and the rule of law is meaningless unless state institutions are impartial among diverse citizens. Yet what has really brought violence to an end in another divided society, the Basque country, is that the Spanish state has foregone the human-rights depredations of the earlier ‘dirty war’ and ETA paramilitaries have been effectively, and legitimately, arraigned by the justice system. Having thus discredited all civic, non-nationalistic forces in favour of a male-only, ethnic oligarchy, the second step—this is where the agreements come in—is a hothouse negotiation which throws these ethnic cartels into government with each other. Since the negotiating parties have no commitment to the common interest and the public good, they treat politics as the continuation of war by other means and ensure deadlocking vetoes are built into the resultant pacts. By contrast, their uninterest in economic and social divides offering alternative political cleavages means they fail miserably to provide basic public services—as, in extremis, with the current ‘You stink’ protests in Beirut, over the inability of the government there to stop rubbish piling up in the streets. The British and Irish governments hope that yet-further talks among the Northern Ireland executive parties will lead to a renewed willingness to remain in government together, perhaps through the revitalisation of a body like the Independent Monitoring Commission, set up in 2004 to reassure political Protestants (aka ‘unionists’—though they show no interest whatever in British political life) that the IRA was going out of business. But even before the latest killings—and this is not to diminish their viciousness nor the concern that more may yet follow—it was evident that Stormont was facing a slow-motion car crash over the inability of the parties to agree on a range of issues dividing them along the critical sectarian faultline. These did not only include the continuing visceral battles over Protestant-communalist parades and Union flag-flying (in a manner which happens nowhere else in the UK except on neo-fascist marches). There is also the wider issue of healing the trauma of the recent past. On this the representatives of small-C Catholic paramilitarism (aka the ‘republican movement’—although no party in democratic Ireland recognises its legitimacy) are fully aware of Orwell’s 1984 dictum ‘who controls the past controls the future’, particularly with the centenary of the Easter rising looming in 2016. So, at best, further talks will lead to another shaky deal which cobbles together the power-sharing executive once more, malfunctioning as ever… until the next crisis blows up. Actually, at this point, it would be better for the British and Irish governments to recognise the merits of reculer pour mieux santer, with an interim period of renewed direct rule and a public deliberation over the way ahead. Admittedly, that would not allow them to disengage from Northern Ireland once more as quickly as they decently can but it could allow of a long-term, stable solution. The fundamental challenge in ethnically divided societies is to engineer constitutional arrangements which enshrine both aspects of democracy (as defined by the standard-setter, International IDEA): popular control and equal citizenship. That the former can be simplified to ‘majority rule’ and the latter to ‘minority rights’ means that parties from demographic ethnic majorities and minorities line up in predictable ways. External brokers have to act in impartial fashion to make sure both features are embedded in democratic constitutions so that, over time, trust is built, ethnic cleavages become of reduced significance and others, such as on socio-economic lines, acquire greater salience. These arrangements need to be buttressed by full adherence to the rule of law and international human-rights standards—including because ethno-political majority parties tend to counterpose the first to the second and vice versa for their minority opponents. The Belfast (or Good Friday) agreement was put together in a few days and then heavily spun, in typical New Labour fashion. Not only did it lack even the ambition in the Taif accord of the ‘abolition of political sectarianism’, three key flaws in the main components of the architecture unwittingly embedded it. Each was motivated by the vital aspiration—as with the more publicly and prudently drafted arrangements of the 1974 power-sharing experiment, sadly truncated by a strike led by Protestant paramilitarism—to transcend the monopoly of Protestant ethnic power which had characterised the first half-century of Northern Ireland’s existence from 1922. But each was poorly thought through in the week leading to Good Friday in 1998, when a draft was finally presented by the two governments to the parties and subject to last-minute haggling. (1) The electoral system: the single-transferable-vote (STV) method was carried over from 1974 without reflection, as if it were the only proportional alternative to first past the post. Yet the more common, additional-member system was to be introduced in devolved Scotland and Wales—as the then taoiseach, Garret FitzGerald, conscious of the clientelist failings of STV in Ireland, had unsuccessfully urged upon the then prime minister, Ted Heath, in the early-1970s deliberations. Heath wrongly insisted STV would help ‘the moderates’: in fact, in a divided society, multi-member STV constituencies incentivise ethno-political entrepreneurs to pitch for the narrow core vote they need to reach the quota for election (just 17 per cent in six-seat constituencies, as for the Northern Ireland Assembly). AMS, while sustaining proportionality via the regional top-up, would at least encourage competition in heterogeneous constituencies for cross-communal majorities. It is an unadmitted fact, including by the party itself, that all three of the Catholic SDLP’s Westminster seats are secured through such tactical (Protestant) voting. AMS would also favour the emergence of new forces, such as the Greens, currently confined to one assembly seat but able to make gains through regional lists, and—most importantly—put real pressure on the parties to remedy, via prioritisation of list candidates, the appalling under-representation of women in Northern Ireland politics. Spot the woman: the Ulster Unionists leave the Northern Ireland executive. Demotix / Stephen Barnes. All rights reserved. (2) Assembly decision-making: to prevent ethnic-Protestant majority voting, as under the old Stormont, the agreement introduced a system of communal designation, under which members of the legislative assembly (MLAs), once elected, were required to register as ‘unionist’ or ‘nationalist’ (or, as a residuum, ‘other’). This was to allow that a ‘petition of concern’ of 30 of the 108 members would require that, to pass, a substantive motion would need to attain not just an overall majority but the ‘parallel consent’ of majorities in each of the communalist blocs. This provision—not even aired when the 1974 system was being planned, it being assumed the executive parties would vote together—has not only had the insidious effect of entrenching sectarian mindsets (all but one of the ‘unionists’ have so far been Protestant, all but one of the ‘nationalists’ Catholic). 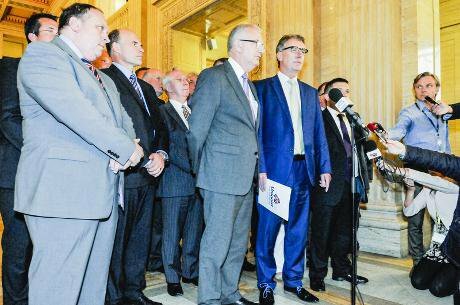 In addition and perversely, though pressed by the SDLP in the 1998 talks, it has been most used by the Democratic Unionist Party—the only party in the assembly big enough to be able to secure a petition of concern on its own—to hold a Canute-like line against modern social legislation, such as on sexual orientation. A weighted-majority requirement could provide belt-and-braces protection on top of a bill of rights but the key constitutional stipulation would be that, after an election, those parties willing to share power should be mandatorily required to agree a cross-sectarian coalition—political Protestants have suggested a ‘voluntary’ coalition, of which political Catholics are understandably suspicious—with those unwilling to join such a coalition forming an opposition to hold the executive to account. This is the only way to make elections meaningful in Northern Ireland, where historically-high turnout has been plummeting, since citizens cannot currently ‘turf the scoundrels out’. It would mean a devolved government that operated with collective responsibility and It would also allow initially small opposition parties, on the left for instance, to play a meaningful political role. None of the suggested reforms raises any ideological issues, because of their impartial character. But none of these constitutional flaws is going to be discussed, never mind addressed, in the talks stewarded by London and Dublin, which will follow a by-now dog-eared agenda. Yet a transformative outcome at such talks will always be debilitated by the parti pris nature of the participants. 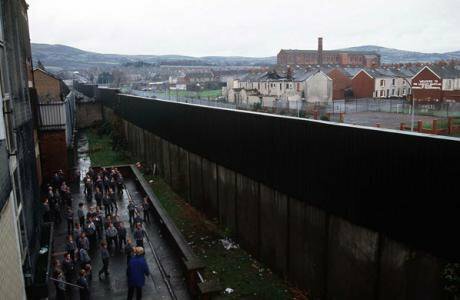 Northern Ireland’s citizens need to be given the chance to become architects of their future, rather than prisoners of their past. But they need the help of the UK and Irish governments to do so.